The effectiveness of a print marketing campaign isn’t measured in the number of handouts created or passed out; its value is measured in responses and new customers you gain. If you can get people to take your information, but you can’t get them to respond, the content in your material could be to blame. Learn what mistakes to avoid. Some people enjoy reading, but this isn’t the general rule. People are forced to read content they don’t want to at school and work every day. If your marketing material doesn’t include information your readers are interested in, there’s a chance they won’t bother reading it. You can increase the overall effectiveness of your campaigns by tailoring your content to suit your demographic. For example, for content geared towards an older crowd, a conversational or personal tone with extra detail might be more favorable. However, for content geared toward a young professional audience, straight to the point content might pair better with their on-the-go lifestyle. All marketing content needs to have a clear goal in mind. If you don’t have an endgame with your material, the problem might not be that potential customers aren’t reading your content; it’s that they don’t know what to do with it. Before preparing your content consider what you want the person to do with the information. For example, for a brochure about a company referral program, the goal is to entice the person to tell someone else about the products or services offered by the company. Content for this type of material should be highly focused on the benefits of the particular products, any incentives offered for referrals and clear directions on how to go about the referral process. Clutter often makes people give up, so it has no place in your printed materials. If you were to walk into a cluttered closet looking for a pencil, after a few moments you’d probably walk out and look elsewhere. If there is too much going on within your materials, you could overwhelm your readers. Too many images combined with large blocks of texts are leading sources of clutter. One high-quality image that portrays what you’re talking about in the text is just as good, if not better, than several lower quality images scattered about. In terms of your text, keep your blocks short and try to include some headers so that readers can skim and find exactly what they’re looking for. Similar to content without a clear goal, a lack of a time limit on your content might be the reason you’re not getting results from your printed marketing campaign that you’d hope – it might not be that no one is reading it. 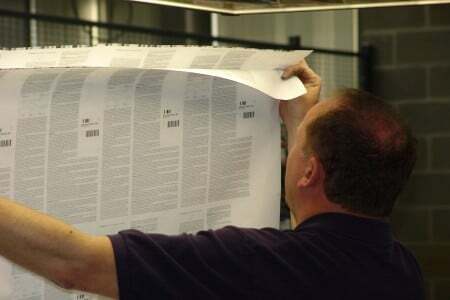 Digital marketing campaigns do offer some leverage over print campaigns in that you can get a more immediate response. You can send a customer a link by email that they may be more likely to respond to right away. If you generate content with offers, such as coupons, that don’t have a time limit, the material is likely to get tossed into a pile of papers the person plans to get to but never does. It’s far more useful to include time restricted offers in your materials. The shorter window of opportunity keeps the content at the forefront of the customer mind and forces them to respond quicker, which is a win-win for you. Apply these tips to turn your printed marketing campaigns into greater success. Learn how Flottman Company can help you move towards this goal with custom printing options. Contact us; we are here to help.